While looking for a way to prevent dynamic stalling in helicopters, DLR researchers in Göttingen struck gold with humpback whales. These marine mammals are renowned for their great speed and acrobatic skills. This is due to their unusually large pectoral fins, which have characteristic bumps along the front edge. 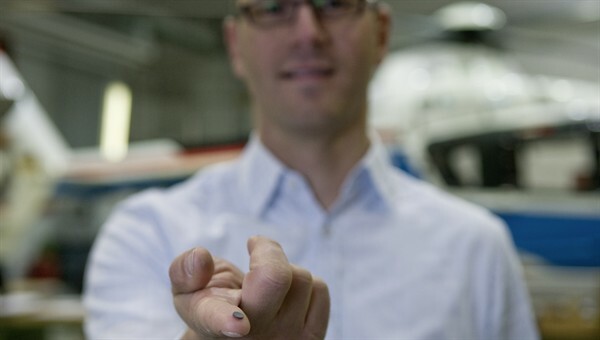 DLR researchers translated the idea of using bumps for delaying the onset of stalling to helicopter rotors, and tested it out using the Bo 105 research helicopter. 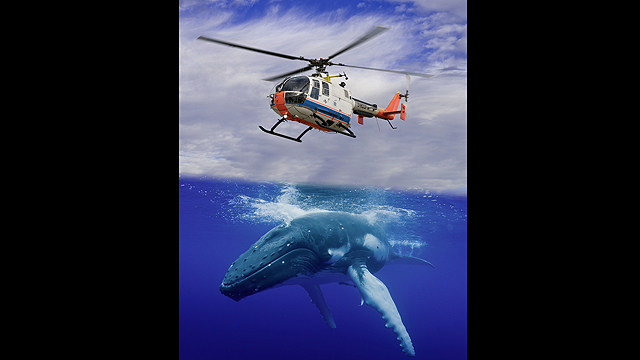 Photomontage of a humpback whale and the DLR helicopter Bo 105.
Credit: DLR/istockphoto.com/Josh Friedmann. Photomontage: DLR. A computer simulation shows turbulence around a rotor blade when the airflow separates from the aerofoil. This phenomenon, referred to as a 'dynamic stall', occurs on a backward-moving main rotor blade during fast forward flight or manoeuvring. The bumps, called Leading-Edge Vortex generators (LEVoGs), have a diameter of six millimetres and weigh only 0.04 grams. Rubber bumps: Kai Richter (left) and Holger Mai of DLR Göttingen inspect the installation of small rubber bumps on the helicopter. 186 bumps were attached to each rotor blade. 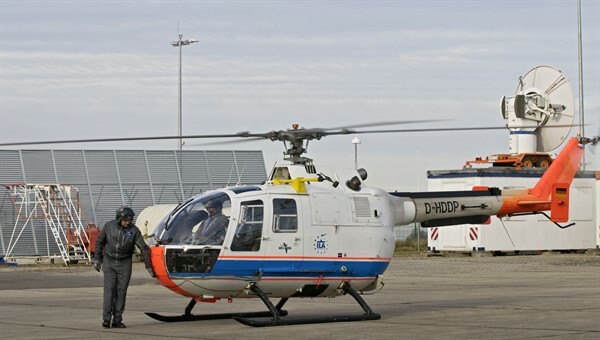 DLR Braunschweig tested the concept using the Bo 105 research helicopter. Modern helicopters could be significantly faster and more manoeuvrable - if aerodynamics did not impose limitations on them. Researchers at the German Aerospace Center (Deutsches Zentrum für Luft- und Raumfahrt; DLR) in Göttingen have now discovered and flight-tested a way to increase manoeuvrability using an idea they got from observing humpback whales. Helicopters owe their special ability to vertically take off and land to their main rotor, but this also contributes to aerodynamic disadvantages. The airflow over a backward-moving main rotor blade separating from the aerofoil during fast forward flight or manoeuvring, referred to as a 'dynamic stall', creates turbulence, loss of lift and exerts large forces on the rotor. Drag increases and the rotor head control rods are subjected to large dynamic loads. "This limits the top speed of helicopters at high altitude and, in particular, their manoeuvrability," explains Kai Richter from the DLR Institute of Aerodynamics and Flow Technology in Göttingen. In addition, the resulting vibration compromises passenger comfort. Modern engines would be able to deliver significantly better flight performance were it not for these limitations. "Stalling is one of the most serious problems in helicopter aerodynamics – and one of the most complex," says Richter. Generating a computer simulation of a moving rotor is significantly more complicated than modelling a fixed-wing aircraft. When looking for ways to delay the onset of stalling in helicopters, researchers at Göttingen struck gold with humpback whales - which is somewhat surprising at first glance. "These marine mammals are renowned for their great speed and acrobatic skills," says Holger Mai from the DLR Institute of Aeroelasticity. This is due to their unusually large pectoral fins, which have characteristic bumps along the front edge. "Research has shown that these bumps cause stalling to occur significantly later underwater and increase buoyancy." DLR researchers translated the idea of using bumps for delaying the onset of stalling to helicopter rotors, and patented it as Leading-Edge Vortex Generators (LEVoGs) "Flow phenomena in water are similar to those in air; they just need to be scaled accordingly," says Mai. The artificial bumps on helicopters are smaller than those on a humpback whale; they have a diameter of six millimetres and weigh just 0.04 grams. Experiments conducted in the wind tunnel were promising, enabling a test flight using the DLR Bo 105 research helicopter in Braunschweig to be successfully carried out, as part of the DLR SIMCOS (Advanced Simulation and Control of Dynamic Stall) project. 186 rubber LEVoGs were glued to each of the helicopter’s four rotor blades. "The pilots have already noticed a difference in the behaviour of the rotor blades," says Richter. The main objective of the initial test flight was to demonstrate the safety of this new technique. "The next step is a flight using special measuring equipment to accurately record the effects," Richter explains. If the concept proves successful, DLR researchers hope that existing helicopters could be retrofitted at little expense. For new helicopters, contours could be milled into the front edges of existing titanium blade designs during the manufacturing process.